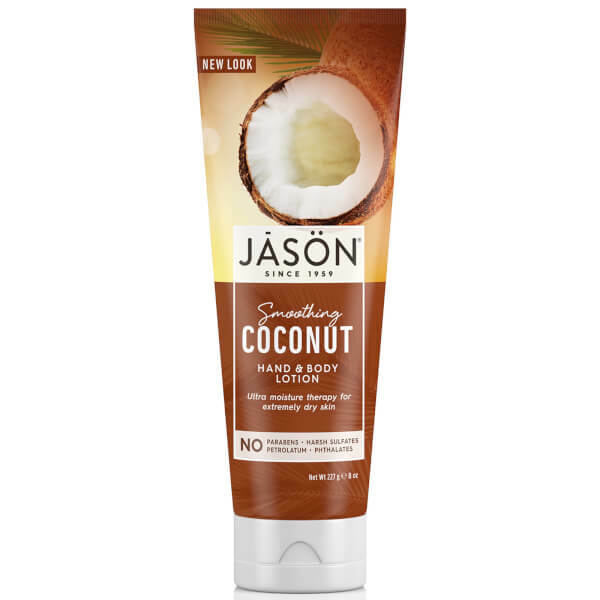 Relieve extremely dry skin with the JASON Coconut Hand and Body Lotion; a fast-absorbing formula that works to soften and smoothen the body from top to toe. 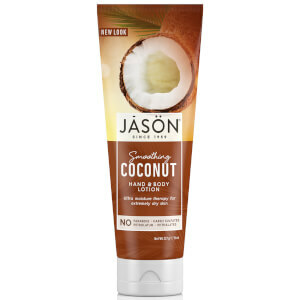 Infused with a conditioning cocktail of Virgin Coconut Oil and Shea Butter, the lightweight lotion replenishes, hydrates and deeply nourishes skin to leave it perfectly pampered and comforted. Apply to slightly damp skin after washing hands and showering. Concentrate on dry areas like elbows, heels, and knees. Aqua (Purified Water), Caprylic/Capric Triglyceride, Cocos Nucifera (Coconut) Oil*, Stearic Acid, Cetyl Alcohol, Glycerin, Glyceryl Stearate SE, Xanthan Gum, Citrus Aurantium Dulcis (Orange) Peel Oil, Ricinus Communis (Castor) Seed Oil, Punica Granatum Extract, Vitis Vinifera (Grape) Seed Extract, Tocopheryl Acetate, Allyl Caproate, Butyrospermum Parkii (Shea) Butter, Citric Acid, Ethyl Butyrate, Isoamyl Butyrate, Vanillin, Phenoxyethanol, Potassium Sorbate, Sodium Benzoate, D-Limonene *Certified Organic Ingredient.